Our project utilizes an array of LEDs that work as light sensors to generate a musical tone, simulating a piano keyboard. 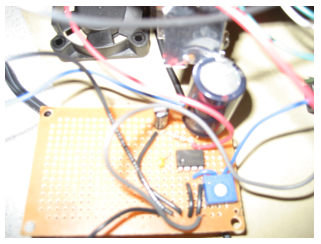 The basic idea is to use LEDs as both emitters and sensors. For our project specifically, we used a total of 63 LEDs, 9 for each of the seven natural keys. Only the middle LED served as photodetector when the key was pressed, absorbing light from the other LEDs reflected from the finger. We then used the Karplus-Strong algorithm for sound generation, all programmed in C. The tone was passed through an audio amplifier, and can be listened through headphones or speakers connected to the audio jack. We chose this project because we wanted to do something with LEDs as sensors, and specifically chose music because of our interest in this matter. The rationale behind this idea consists of using a diode in a 3 step process, as shown in the following schematic. Each step is approximately 1 millisecond long. The upper pin will starts at Vcc and stay there for one millisecond (step one), and then drop to ground for two milliseconds (step two and three). The lower pin will start at ground for step 1, then rise to Vcc for the length of step two and finally the diode will discharge exponentially due to the hole-electron generation due to the incident light on the LED (8 pin leakages). For the sound generation we will use the Karplus-Strong algorithm developed in the 80s, which is computationally simple. It is a method of physical modeling a string that simulates the sound of some types of instruments, including the piano. It uses a low pass filter and a delay block, which we will implement in software. A schematic of how it works is shown below. Where N is the length of the delay line, and fs is the sample frequency at which the loop is updated. For this project we used a sample rate of 8 kHz. While this sample rate causes some quantization of possible frequencies since the delay line has only integer lengths, we were still able to get relatively accurate frequency synthesis. The input x(n) is excited using a signal noise until the delay line is filled to excite the entire system. where g is a loss factor that must be less than 0.5 for the system to be stable. By making g smaller the signal will die out faster. Above is a block diagram of the system wiring. 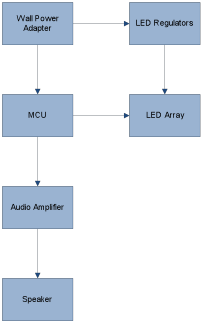 The MCU interfaces with the LED array to get the human touch interfaces, and then produces a sound output that is passed through the audio amplifier to the speakers. We implemented a low pass filter in software for the Karplus-Strong algorithm. 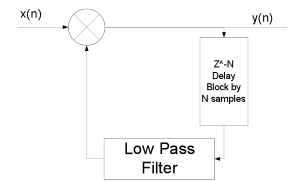 Even though low pass filters can be made with hardware, for this part it was necessary to do it in software. Also, while we implemented the Karplus-Strong in software, the algorithm would work much faster in hardware, but we did not have the expertise nor the time to design on the algorithm on an FPGA. We also decided to use integers for our variables in our code instead of floats because even though this gives less accuracy, it is faster and timing was more of an issue. One standard that we followed in our design is ISO 16:1975 that specifies that in music the A above middle C is 440 Hz. Some intellectual property rights we considered are two patents, both concerning the Karplus-Strong algorithm. One patent is the �Wavetable-modification instrument and method for generating musical sound� (Patent Number 4,649,783) and the other is �Independently controlled wavetable-modification instrument and method for generating musical sound� (4,622,877). They are both expired, since they were filed in the early 80s. The software was grouped into two functions. 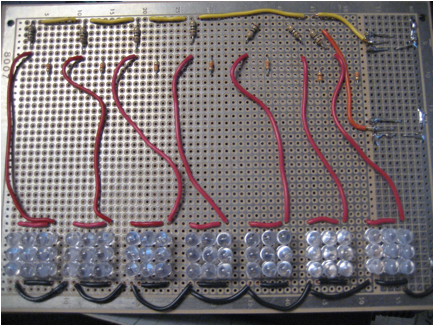 The first was the sensing of the LEDs and the second was the generation of the audio tones. 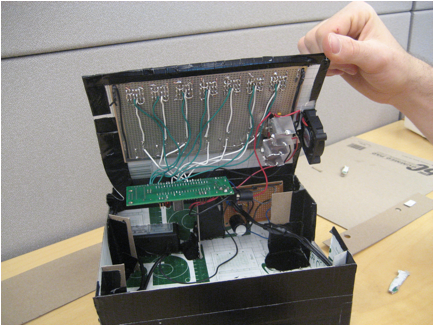 The LED sensing was controlled by a state machine that updated approximately every millisecond and scanned the entire keypad one button at a time. Since we only had 7 buttons, we were able to scan the keypad in around 16 ms. This routine would then either reinitialize the Karplus-Strong routine for a specific button, or it would change the damping on the string to shut off a button. The Karplus-Strong sound synthesis was always running. The strings were always being updated, and whether they were playing audibly or not was depended on the damping on the string. The button routine would set the damping really high if the button was not pressed. This is equivalent to the strings of the piano always being present, except being heavily damped. A part that was tricky to write the part of summing of each of the outputs from the Karplus-Strong. This was difficult due to the fact that we were using only a 10 bit PWM on timer 1. To do this we first added up all the outputs as longs, then, since they are represented using 16 bits, we right shifted the value by 9 bits since the addition of 7 16 bit numbers could produce 19 bits of output. Then an offset was added to center the PWM at the middle of its range. The major hardware components were the 63 Ultra Red 1000mcd 5mm LEDs. These 1-inch LEDs have a water clear epoxy. The maximum forward current is 20mA, with a maximum forward drop of 2.0 V and maximum reverse voltage of 5 V. All these were soldered to the large bread board, by arranging them by 9 LEDs (3 rows, 3 columns) per key. To limit the current through the LEDs a 10 ohm resistor was used for the 8 non sensor LEDs in each key, and a 330 ohm resistor was used for the sensor LED. The rims of the LEDs were trimmed using the Dremel tool to remove the flange to get the LEDs to fit closer together. One thing that we tried and did not work was to use the oscilloscope while testing. This was because the scope loaded the LEDs too much and corrupted their discharge time, so the device would not operate properly. Two LM317TFS Voltage Regulators were used, which are capable of supplying 1.5 A of current, with an adjustable output voltage from 1.2V to 37V. They were configured to output approximately 3.2 V for the LEDs. One regulator was used for 4 keys, while the other was used for the other 3. A small piece of aluminum sheeting was used to make a heat sink for each of them, and a fan was used to keep these regulators cool, as seen in the picture below. 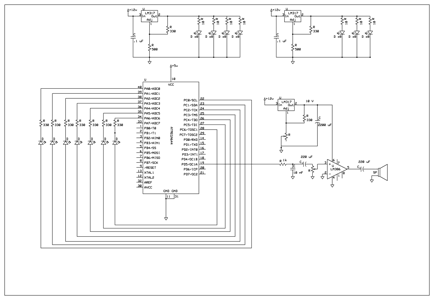 For the output we used an LM386 audio power amplifier with a variable gain from 20 to 200. Set up the device to use a gain of 20 to prevent saturating the output. It came in an 8 pin DIP package, which can be seen in the picture below. The Atmel ATMega 664 was used to control the entire system. This was mounted on a board that includes a power supply, crystal clock, and programming interface. 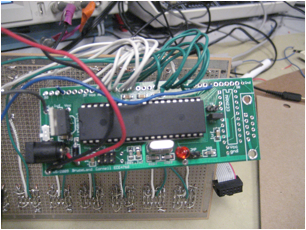 A six-pin header allows flash memory programming from an STK500 or other Atmel programmer. 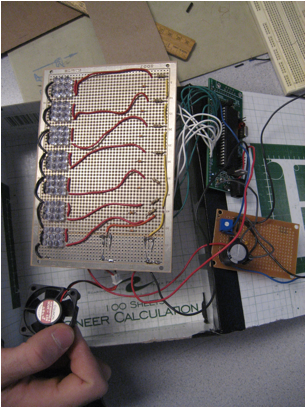 Timer 0, controlled of the polling of the LEDs, was ran at a speed of approximately 1millisecond. This updated the state machine, which had 16 total states. This meant that we could scan the entire LED array is approximately 16 ms. The actual polling of the LEDs was put in another routine so that it could be interrupted by the much faster Timer 1 ISR. Timer 1 was executed at a speed of 8kHz to control the sampling of the Karplus-Strong algorithm. Timer 2 was clocked at 20 MHz to generate the PWM output for the audio signal on pin D5. There are no safety considerations with our project since we are not using extremely bright LEDs (which could affect the retina) nor will the volume be too high to affect the human ear. However, as with any light source, like a bulb, staring at it for a prolonged period of time could damage the eyes. 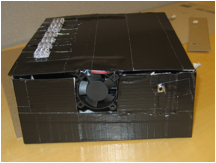 Our project does not radiate any harmful signals that would interfere with any electric circuits to our knowledge. And our project accepts all interference. Our product will be used as recreation for people interested in music and playing the piano. People with special needs will not be using our product, with the exception of the blind. They could play the notes but will not be able to appreciate the LEDs. The behavior of the LED buttons varies based on skin reflectivity; however, we have calibrated the sensitivity to respond to the lowest reflectivity. However, this means the interface will behave differently with skin tones. In conclusion, our final project met all the specs that we initially set out to do. 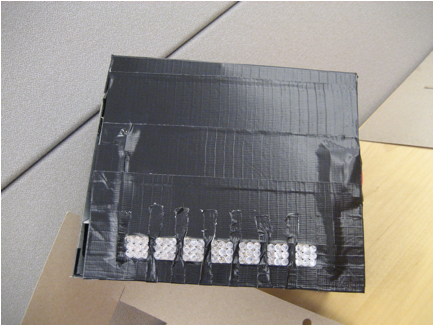 We used LEDs as sensors to simulate a piano octave. We used the Karplus-Strong algorithm to accurately generate sound. We stayed well below the $75 dollar limit, and even spent less than we predicted. While we are happy with out results, there are some things that could be improved. First of all, we could increase the accuracy of the PWM from 12 bit to 16 bit. We could also add the flat/sharp tones to the octave, as a piano has. Finally we could use a plastic enclosure instead of a cardboard one. The only standard we had to follow has that A440 is the standard for musical pitch, the ISO 16:1975. As it is seen in the accuracy results section, we did follow this standard for all notes in our octave, beginning with middle C.
There were no intellectual property considerations since we did not reuse someone�s code or design. We did not use code from the public domain either. Or reverse engineering. Although we used the Karplus-Strong algorithm, this patent expired so there were no issues. We also did not sample any parts that required non-disclosure forms to be signed. There are no current patent or publishing opportunities for this project. Since we are committed to the highest ethical and professional conduct, we abided by the IEEE Code of Ethics when developing this project. We were consistent specifically with rules 7, 8 and 10. Rule 7 states that we agree �to seek, accept, and offer honest criticism of technical work, to acknowledge and correct errors, and to credit properly the contributions of others�. We credited the Karplus-Strong Algorithm for sound generation, as well as sought and accepted help from our professor Bruce Land and other teaching assistants. We also credit our several sources that gave us information about using LEDs as sensors. Rule 8 states �to treat fairly all persons regardless of such factors as race, religion, gender, disability, age, or national origin�. We took this into consideration when setting our detection threshold, since different skin tones respond in distinct ways. Our LED piano senses even the least reflective skin tones, so there is no discrimination towards race. Also any person, from any country, of any age and gender can use our project. As we stated before, people with disabilities will not be using our product, with the exception of the blind. Rule 10 affirms that we are to �to assist colleagues and co-workers in their professional development and to support them in following this code of ethics�. There is another group that is also producing musical strings for their project, and when they asked for help we supported them by giving them advice on what we had done. We also offered advice to other groups working with LED and getting them to fit on the bread boards which had pin spacings that were rather small. There are no legal considerations, since all patents have expired. //!! !DO NOT CONNECT Aref jumper!!!! ;* Signed multiply of two 16bits numbers with 16 bits result. mov r25, r0 ;r18, r0"
mul r22, r20 ; al * bl"
mov r24, r1 ;movw r17:r16, r1:r0"
add r24, r0 ;r17, r0"
adc r25, r1 ;r18, r1"
Here is a list of the specific tasks in the project carried out by each team member.